Earn up to 27 Vaportiser Loyalty Points. An epic release with proper homage to the original H-PRIV, the SMOK H-PRIV 2 225W Starter Kit presents an exquisite combination of high-performance and visually striking designs to pair with the TFV12 Big Baby Prince Tank. Epitomizing the culmination of SMOKTech’s industrialized manufacturing and design prowess, the H-PRIV 2 225W Box Mod implements an elegant cobra-design patterns, carbon fiber inlays, and the signature lateral fire key mechanism. The rest of the chassis is constructed with refined details for an embellished yet ergonomic handling for a dual 18650 battery platform (sold separately). The H-PRIV 2 Box Mod has been designed to integrate all of company’s most cutting-edge technology, introducing a truly customizable and user-friendly colorful OLED screen that provides essential data at a glance with vibrant display, from detailed battery state and output adjustments. Powered by an advancement in chipset capability, the H-PRIV 2 has a maximum output of 225W and a plethora of output adjustments ranging from sophisticated temperature control suite with added Memory Mode for increased precision. 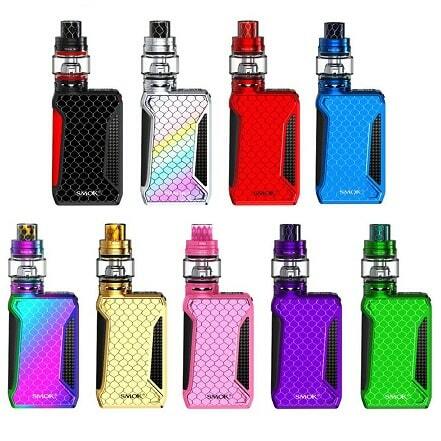 The new SMOK TFV12 Big Baby Prince Sub-Ohm Tank features a maximum capacity of 6 milliliters, new button-lock hinged top-fill, smooth dual bottom airflow control, and the utilization of the TFV8 Baby Coil System. Each kit includes the 0.4ohm V8 Baby-Q4 coil along with the new 0.15ohm V8 Baby-T12 duodecuple coil structure rated for 50-90W.